Front and rear suspension keeps the ATV buoyant over rough terrain, and the On-Command® 2WD/4WD system allows you to easily switch between suitable driving modes. 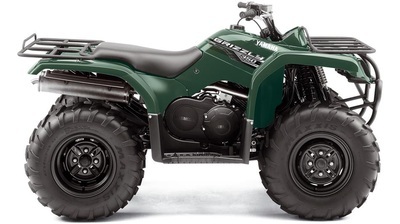 With rear and front racks the Grizzly 350 4WD also has the ability to carry loads up to 120kg. Econonical with fuel, low in maintenance, it's the packhorse of the ATV world - strong, tough and durable. And combined with a range of our practicial accessories - from winches to ploughs - working was never so much fun.